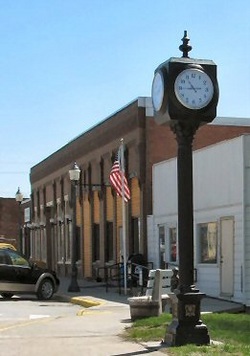 Macedonia is one of the oldest and most historic towns in Southwest Iowa. Macedonia was first founded on the east side of the Nishnabotna River in 1846, because of frequent flooding and the coming of the CB&Q Railroad was moved to its present location in 1880. You will find the Mormon Trail winding through the town and nearby countryside. The town has a covered stadium that is one of two remaining in Iowa, a beautifully shaded park with playground equipment and a walking trail. A half mile from town is the descent to the river at Olde Town Park where Mormons crossed the river on limestone rock ledge. Macedonia offers a small-town family life with the heart of an old-fashioned village. Throughout the year the community is busy with events and activities…Grist Mill theatre productions & art shows, community dinners, Annual Donia Day celebrations, Fire Department activities, MHPS Annual Nishnabotna River Rubber Ducky Race, and an access point to the West Nishnabotna River Water Trail. Main Street (Pioneer Trail, County Road G-66) runs through the center of town and connects to north/south running Highway 59, just one mile east of town. Main Street also provides access to east/west running Highway 92 via County Road M-16, which runs just west of the community. Please visit our web site regularly for updates. Thanks for visiting and come back soon! 5, 6 & 7 - Grist Mill Presents "A Bad Year for Tomatoes"
7, 8 & 9 - Grist Mill Presents "Bed Time Stories (As Told by our Dad) (Who Messed Them Up)"